Iran’s Islamic Revolutionary Guard Corps with a billboard of Supreme Leader Ayatollah Ali Khamenei in the background. Credit: Wikimedia Commons. 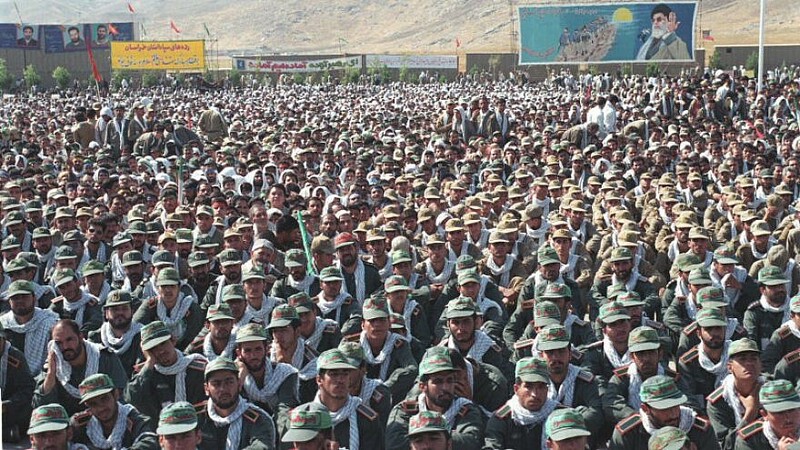 (April 9, 2019 / JNS) When it comes to examining the decision by the Trump administration to designate Iran’s Islamic Republican Guards Corps (IRGC) as a terrorist entity, the move will ultimately be judged by how successful it will be in changing Iran’s conduct. On the level of international norms and ethics, the designation is certainly fitting, as the IRGC and its overseas operations unit, the Quds Force, are today the primary terrorist production agency in the world. Created as a parallel force to the regular Iranian army after the 1979 Islamic Revolution, the IRGC and Quds Force arm, train, fund and deploy radical forces across the Middle East. They are Iran’s umbilical cord to its array of terrorist proxies, including Hezbollah in Lebanon, hardline Shi’ite militias in Syria and Iraq, Palestinian Islamic Jihad in the Gaza Strip and the Houthis in Yemen. The international community has, for years, been tolerant to an almost astonishing degree of these activities. The IRGC and Quds Force set up attack bases, weapons production sites and asymmetrical strike forces across the region, threatening the security of Israel as well as Sunni states like Saudi Arabia. The IRGC is directly responsible for a role in working to destabilize the Middle East. The IRGC also plays a central role inside Iran, where it manages a huge portion of the country’s economy, including the energy sectors, major infrastructure programs, the nuclear program, petrochemicals, banking and construction companies. As a result, the designation can create significantly more economic pressure on the Islamic Republic, with international companies and states fearing the prospect of doing business with IRGC front companies and not being clear on which companies fall under this category. This fear could make them avoid doing business with Iran altogether. The designation joins crippling unilateral American sanctions leveled by the Trump administration in two waves in 2018, targeting the country’s oil, banking and shipping sectors. Eight countries received waivers from the sanctions. The test: Will it change Iran’s behavior? Just like the 2018 sanctions, the latest designation of the IRGC will ultimately be judged by how effective—or ineffective—it will be in changing Iran’s behavior. These measures are designed to get Iran to enter into negotiations with Washington over a new and better nuclear deal, and to roll back its aggressive, dangerous conduct in the Middle East. While the ability of the United States to cause very significant economic damage to Iran is real, Washington is also acting largely alone and has been unable to recruit European states, China or Russia to join the sanctions. Nevertheless, multinational European companies do fear being exposed to American sanctions and the latest terror designation—this, despite a European Union attempt to shield these companies from the U.S. sanctions on Iran’s banking system. It means that Iran’s leadership could be encouraged by the idea that the United States has split off from other international actors, and that the international community will not act in unity to push Iran into the corner, like it did prior to the 2015 nuclear agreement. Another question that remains unanswered so far is whether it will be possible to track down all of the IRGC-linked front companies to enforce the new designation. The move could also further exasperate tensions inside Iran between the reformist bloc, led by Iranian President Hassan Rouhani, which negotiated the 2015 deal, and the conservative-IRGC bloc, which was suspicious of the deal and has accused Rouhani of failing to deliver on his promise of economic access to the global market. This accusation has the support of the final and most important decision-maker in Iran, Supreme Leader Ayatollah Ali Khamenei. In the background, ongoing demonstrations by the Iranian public demanding better economic conditions are placing the regime under some pressure. Will Iran lash out against the latest designation? So far, Iran has chosen to double down on all of its positions, refusing to renegotiate the nuclear deal, continuing its aggressive behavior in the Middle East, while also keeping its nuclear program frozen, as far as is publicly known. The latest measure by the Trump administration raised prospects of Iranian retaliation via proxy against U.S. forces in the Middle East, in places where Iran can order strikes, like Iraq. U.S. officials have already stated that “all measures” necessary have been taken to protect the 5,000 American forces in Iraq. Iran could also theoretically lash out at Israel via a proxy entity or other U.S. allies in the region, although it would expose itself to retaliation by doing so. Iran has repeatedly threatened to close off the strategically vital Strait of Hormuz, which is the world’s most important oil shipping artery. However, such a drastic move would likely trigger U.S. military action, and Iran has displayed a cunning ability to pursue its interests and take risks without entering into direct military conflict with rivals and foes. Another and more likely response will be continued Iranian attempts to bypass American measures, using its regional clout in neighbors such as Iraq, which just last month signed large trade pacts with Iran. Khamenei can be expected to call on Iranians to get behind the “resistance economy”—a term describing self-sufficiency and a willingness to put up with economic pressure from the outside, while also blaming the latest developments on Rouhani and his reformist bloc. Already, several European and Asian companies have left Iran, and the Islamic Republic will certainly be concerned by the latest designation of the IRGC. Domestically, the IRGC could use the designation to further weaken Rouhani. Last but not least, the question of when Iran decides to reactivate its nuclear program remains an open question.